One Bay Area lawmaker’s proposal to accelerate housing construction has put two San Diego lawmakers in quite the dilemma. The policy in question addresses a third rail of San Diego politics: the coastal housing limit. 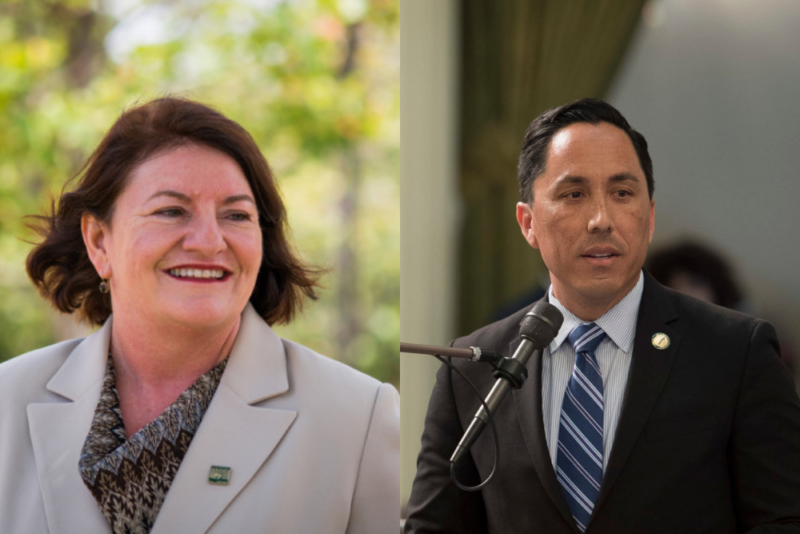 Though both Assemblyman Todd Gloria and Senate President Pro Tem Toni Atkins are outspoken about wanting to address the state’s housing crisis, Gloria happens to be running for mayor and Atkins has a history of avoiding rocking the boat. Both are responding cautiously to Berkeley Sen. Nancy Skinner’s SB 330, which would roll back many city and county home-building regulations for a decade. Skinner’s office told the Los Angeles Times this week that the bill would apply to San Diego’s coastal height limit, a sacred cow that has defined development in beach communities for decades. Atkins and Gloria said Friday they hadn’t had a chance to dig into Skinner’s bill yet. Both told Voice of San Diego they wanted to ensure community perspectives were heard before the state halts coastal height limits. Atkins said she appreciated the discussion SB 330 would spur but was leaning against a sweeping moratorium on height limits in favor of a more regional, community-by-community approach. She seemed more open to the tack taken in SB 50, Bay Area Sen. Scott Wiener’s bill that would end height limits near transit rather than ax them altogether. But she emphasized the need for communities – perhaps led by regional planning agencies – to have a chance to weigh in and assess the impacts of any height limit adjustments. Gloria said he was concerned that Skinner’s bill could overrule San Diego voters who approved the coastal height limit in 1972 and wanted to see a legal opinion on the issue. Like Atkins, Gloria said he favored a regulatory approach tailored to particular communities. He said cities and counties can also address the housing shortage in other ways, such as increased granny flat development or building denser projects with more small units. “I know my constituents and I know that they feel very strongly about the coastal height limit and I think that’s OK as long as every community’s willing to do their part to help solve the housing crisis,” Gloria said. Separate from Weiner’s SB 50, San Diego Mayor Kevin Faulconer has proposed eliminating building height limits in transit-rich neighborhoods across the city, outside of the coastal zone. Gloria and Atkins had gathered on Harbor Island Friday to promote a different Senate bill – one they were much more eager to discuss. That bill, SB 1, is a second attempt at a measure that was first brought up last year by then-Sen. Kevin de Leon. It would establish baseline environmental, health and labor standards that the state must follow even if the federal government rolls back its standards. Atkins noted the federal government under Trump has already rolled back numerous environmental protections. “Surprisingly absolutely no one, the coal lobbyist now at the helm of the EPA or the oil lobbyist in charge of the department of the interior are systematically under-enforcing the laws that remain,” she said. The bill “simply ensures no backsliding when it comes to the protection of our irreplaceable environmental and natural resources,” Atkins told the Senate environmental quality committee. Several environmental groups spoke in favor of the bill, while a representative for the California Chamber of Commerce said the group admires the measure’s goal yet opposes the bill because it believes it will spur litigation and regulatory uncertainty. Republican Sen. Pat Bates, who represents parts of northern San Diego County, said she thought the bill was unnecessary. “Why do we need it? Having served in local government for many years, we often adopted regulations or ordinances that exceeded a state standard. … When I read it I thought, ‘Why are we doing this?’” she said. The bill passed through the committee 5-2, with Bates and another Republican senator opposed. Assemblyman Todd Gloria’s bid to clear up confusion that may have contributed to San Diego’s sluggish response to a deadly hepatitis A outbreak sailed through the Assembly’s health committee this week despite protests. Dozens showed up at the state Capitol on Tuesday to speak out against AB 262, alleging that it could give public health officers unlimited power and compel vaccinations. “This bill is overly broad and could result in abuse of power,” said Christina Hildebrand of A Voice for Choice, a group that has opposed other legislation requiring vaccinations. Her group has urged Gloria to amend the bill. Many of the more than 90 speakers who followed Johansen and Hildebrand’s longer presentations referenced beefs with inoculation mandates or adverse reactions to vaccines. Lobbyists for the city and county spoke in favor of the bill. Gloria has said the disconnect between local governments during San Diego’s hepatitis A outbreak – not a focus on vaccinations – inspired the bill, which is co-written by Assemblywoman Lorena Gonzalez. “There is nothing in AB 262 that offers the authority for compulsory vaccination,” Gloria said Tuesday. After hearing the testimony, the Assembly committee voted 13-0 to forward Gloria’s bill to the appropriations committee, which is led by Gonzalez. Mayor Kevin Faulconer and other big-city mayors in the state had a message for Gov. Gavin Newsom this week: Show us more of the money. At a Wednesday meeting in Sacramento, the group of mayors urged Newsom to allocate more homelessness cash to cities a year after Faulconer and others successfully pushed for $500 million in emergency homelessness grants for major California cities and regional groups last year. They also nudged Newsom to change some of his funding priorities. Newsom said he planned to tweak his budget to reflect the mayors’ wishes though he did not elaborate on his plans. Newsom’s proposed budget already includes $500 million for local governments, including $200 million to fund supportive housing and shelters. “I took notes and I’m taking direction,” the governor said. At a post-meeting press conference, Faulconer didn’t offer specifics on what he had lobbied for during the meeting, though he urged state leaders to prioritize reforming the state’s foremost environmental law, which can be used to tie up controversial developments, and addressing the loss of redevelopment funding that once supported affordable-housing development. “As mayors, we’re held accountable, and rightfully so on most things, and how do we work together to actually match accountability and responsibility and state dollars?” Faulconer said. This year, the city accepted $14.1 million in emergency homelessness funds it plans to spend on an array of services and housing subsidies, while the countywide Regional Task Force on the Homeless is set to dole out $18.8 million in state dollars. Meanwhile, San Diego County is about to get a new burst of homelessness funding. State officials announced this week that the region will receive an initial $40.7 million in funding from Prop. 2, a successful November 2018 ballot measure aimed at using funds collected via a 1 percent tax on millionaires to bankroll supportive housing for people who are chronically homeless or at risk of falling onto the street. Relegated to a superminority in the Legislature, California Republicans see one of their primary roles as pushing back against new taxes and other spending. On that effort, they’re as vocal as ever. In an op-ed this week, Escondido Assemblywoman Marie Waldron, the Assembly’s Republican leader, pushed back against a proposal to tax soda, which is billed as a way to fight obesity. Meanwhile, Sen. Brian Jones has revived his video series, “Are You Kidding Me?” and in the most recent installment, he rails against a proposal from the California Public Utilities Commission that would have allowed regulators to charge a fee for text messages. Though that proposal quickly died, Jones has written a bill to pre-emptively prevent such a plan from being implemented. “Urban water districts, including many in the San Diego region, have opposed the tax because they might end up being responsible for collecting the new revenue – which could require more administrative overhead at hundreds of agencies across the state and also make them subject to ratepayer ire for higher bills. The tax would be about $1 per month and most proposals include exemptions for low-income ratepayers. Of course, Democrats are not necessarily eager to pass too many taxes either – one of their own, Sen. Josh Newman, was successfully recalled last year after voting to support the gas tax increase. As CALmatters notes, Assembly Democrats Tasha Boerner Horvath and Brian Maienschein represent districts that voted in favor of the gas tax repeal. A law passed last year, co-written by Sen. Toni Atkins, requires most companies in the state to have at least one woman on their board by the end of the year. Bloomberg delved into what it might look like if the policy were scaled out nationally.